Eucharis is one the best known representatives of the bulbous familiy Amaryllidaceae. 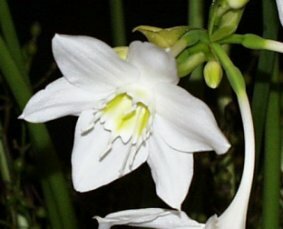 The genus contains about 17 species en can easily be recognised by the sweet scented, white flowers. They are born in an umbel. The flowers have a perianth tube with six segments which spread widely. The six stamens are united into a corona or cup. Closely related to Eucharis is the genus Caliphruria. This genus contains only four species. The habitat of Caliphruria is restricted to Peru and the western part of Colombia. The species of this genus have leather like, glossy leaves which stand on a rather long petiole. Both genera are evergreens and grow in humid, warm areas. They grow mainly in the rain forests. Despite all the similarities, Caliphruria never got the reputation that Eucharis has. Besides that, they are also less known in cultivation. Caliphruria contains four species: C. hartwegiana, C. subedentata, C. tenera and C. korsakoffii. Only the last one is limited in cultivation. Caliphruria korsakoffii grows only in North-central Peru. This species has a globose true bulb which can reach a diameter of three cm. The bulb grows just below the surface of the soil and has a brown coloured tunic. The bulb forms two to four oval to lanceolate shaped leaves. The 10 to 12 flowers look alike Eucharis x grandiflora flowers, but then in miniature. Each fower is open for one to three days. The flowering period is May-June. Caliphruria korsakoffii isn't very difficult to grow. It is grown in warm (20-25 ºC) and humid conditions. During the winter months the minumum temperature is 10 ºC. Therefore it is a plant which you can grow indoors on your windowsills or in a heated glasshouse. The plant can be grown on a place in full sunlight. Furthermore the plant is watered throughout the whole year: in summer more than in winter. During the winter months just enough water is given to prevent the leaves from dying off. The plant is only repotted every two to three years. C. korsakoffii forms easily off shoots. Meerow, A.W. 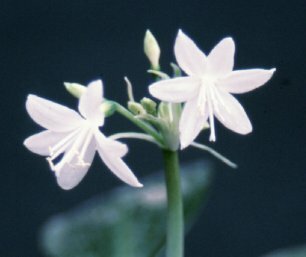 Systematics of the Amazon Lilies, Eucharis and Caliphruria. Annals of the Missouri Botanical Garden, 1989, (76), 136-220.